Bodde, Derk (1978). "The State and Empire of Ch'in". In Twitchett, Denis; Loewe, Michael. The Cambridge history of China. 1. প্ৰকাশক Cambridge: Cambridge Univ. Press. ISBN 0-521-21447-5. Cotterell, Arthur (1981). The first emperor of China: the greatest archeological find of our time. প্ৰকাশক New York: Holt, Rinehart, and Winston. ISBN 0-03-059889-3. Guisso, R.W.L. ; Pagani, Catherine; Miller, David (1989). The first emperor of China. প্ৰকাশক New York: Birch Lane Press. ISBN 1-55972-016-6. Yu-ning, Li, ed (1975). The First Emperor of China. প্ৰকাশক White Plains, N.Y.: International Arts and Sciences Press. ISBN 0-87332-067-0. Qian, Sima (1961). 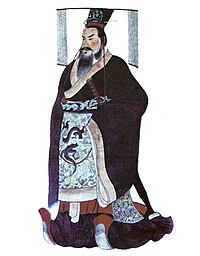 Records of the Grand Historian: Qin dynasty. Burton Watson, trans. প্ৰকাশক New York: Columbia Univ. Press.